Vultures are a bird species that have become locally extinct from Delhi region since almost two decades now. Vulture play a key role as scavengers in the natural ecosystem which makes them important. Their declines and local extinction from Delhi has therefore been a major loss to Delhi’s urban ecosystem. The reason for the decline of vulture populations in Delhi is largely attributed to the use of the drug diclofenac. Diclofenac, a pain killer drug which is administrated to cattle and once vultures feed on the dead cattle, the drug enters the vulture’s body and leads to the subsequent wiping out of entire vulture populations. Once this was known, diclofenac was banned by the government. The impact of dicloefenac was also felt on vulture populations living along Delhi and in the neighbouring agricultural states of Haryana, Punjab and Uttar Pradesh. The launch of the reintroduction of vultures in the area now is therefore a welcome step for boosting regional environment of North India. “With the success of the programme, I believe we would again touch the number of four crore vultures in the country in the next 10 years”, wished Environment Minister Prakash Javadekar after visiting the vulture breeding and conservation programme being carried out at Jatayu Conservation Breeding Centre, Pinjore in Haryana. 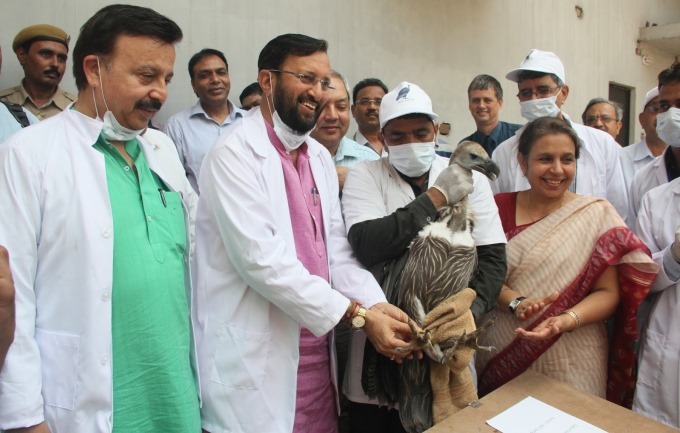 The Environment Minister, along with the Chief Minister of Haryana, also released two Himalayan Griffons into the wild from the Jatayu Conservation Breeding Centre, Pinjore. When they lifted the front netting giving the captive Himalayan Griffons the option of joining the wild Griffons, the released vultures readily stepped outside and joined the wild vultures. Shri Javadekar lauded the support extended by the Haryana Government in this reintroduction programme. While releasing captive vultures in pre-release aviaries close to the breeding centre, he even gave one of them the name of Jodh Singh! “The government has fixed a target to increase the existing forest cover in the country to 33 per cent,” he informed all present. Speaking on the occasion, the Chief Minister Mr Manohar Lal said that the Haryana Government is formulating a scheme to conserve forests in the state. He informed that besides various schemes in the Shivalik hills, the 500 meter area around Mangar Bani forest has been declared ‘no construction zone’ by the state government. The Government is also formulating a scheme to develop Herbal Park in 500 acres of land in Morni. The Union Minister later handed over 10 captive bred vultures, which have siblings at the centre, to Field Director, Van Vihar National Park, Madhya Pradesh, Shri A.K. Srivastava, as a part of the genetic management of captive vulture population. Note that the Himalayan Griffon is closely related to the critically endangered resident Gyps species of vultures but is not endangered. The two released Himalayan Griffons have been in captivity for over 10 years at this facility and have been in the aviary with resident Gyps vultures.